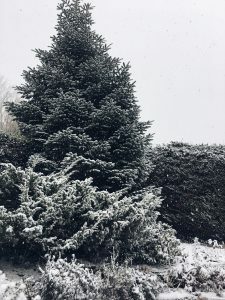 On the last day of winter, Falmouth and the whole country turned into a Winter Wonderland. As I am from a country (Russia) where snow is something completely normal, I was very excited to see the reaction of people who have never seen snow before. 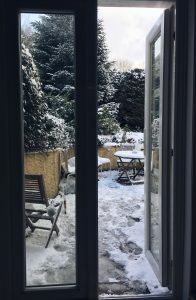 I was one of the of the people in my house who woke up early and saw the magical snow outside my window. 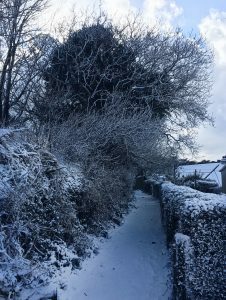 Everyone went out in their pyjamas, stared taking pictures, posting on social media and checking whether or not our friends had seen how beautiful snowy Falmouth looks. The first idea that came into my friend’s head was: ‘’Let’s build a sled!’’ And he was not the only one who wanted to enjoy the snow as much as he could. After an hour of making something to slide on, we we went outside to find the perfect hill and try out our home-made sled. We saw so many students and local people trying to do the same thing. People were skiing, snowboarding, throwing snowballs, sliding on surfboards, kayaks and other things you would never imagine it’s possible to slide on. We had so much fun and enjoyed the snow a lot! As it was extremely cold and windy, we went to have hot chocolate to one of my favourite places in Falmouth – Espressini. The atmosphere in town was so nice and cozy, it felt like Christmas time, we even saw a guy wearing Santa Claus costume! The weather stayed like this for 3 days. On the second day we faced the consequences… As it doesn’t snow every year, people are not well adapted to this weather. Our houses (as we are second year students, we don’t live on campus anymore) became quite cold and we weren’t so excited about the snow anymore. However, the people from our letting agencies were very helpful and understanding, they called the maintenance services and provided us with extra heaters. My flatmates are from Europe so they are not used to the weather like this either. One of my course mates from India said he had never seen snow in his life. After the three exciting days the snow eventually melted and everything got back to normal. 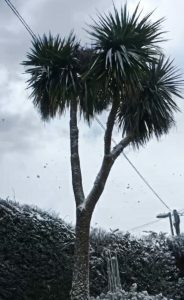 I hope we will see snow again in sunny Falmouth, and I will try to be more prepared next time.